Rooster Teeth is the Youtube production company behind Lazer Team, the first feature movie released under the Youtube Red banner. The movie collected a record-breaking $2.4M on Indiegogo two years ago to become one of the top crowd-sourcing funds ever. When the king Antareans warn mankind of an impending alien attack, Earth trains Adam (Alan Ritchson) from birth to be our defender. The Antareans send down a power suit Adam is supposed to wear to fight the Worg, but the suit doesn't make it to Adam. Instead, inept cop Hagan (Burnie Burns), cocky jock Zach (Michael Jones), stoner Woody (Gavin Free) and has-been athlete Herman (Colton Dunn) discover the suit. 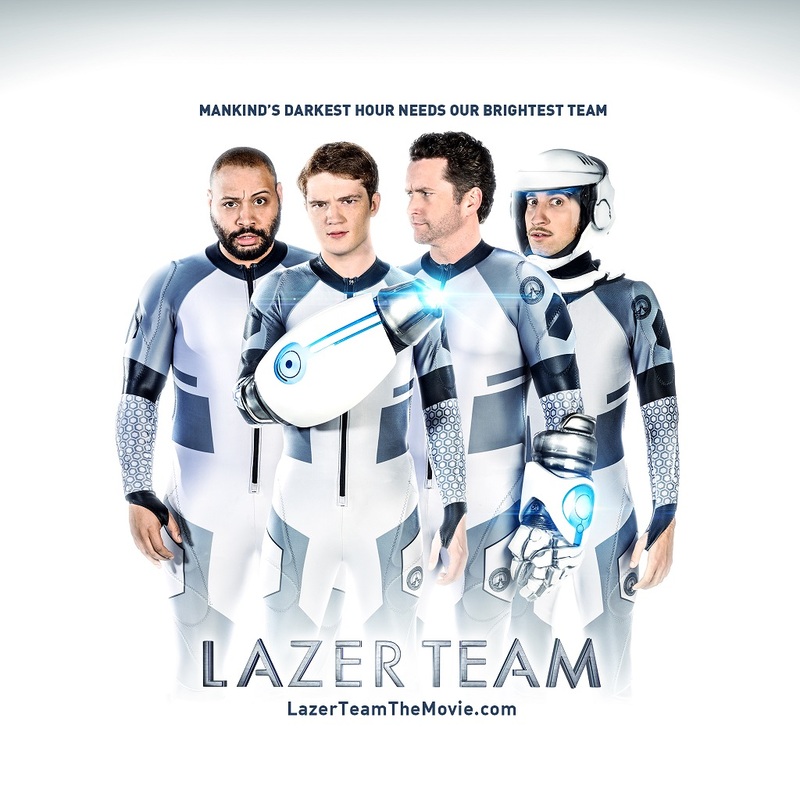 They each pick one of the four parts, and become genetically linked to the armor, so now Adam has only a few days to train these losers to be the Lazer Team. Casting for this movie is excellent and everyone gives a great performance but Colton Dunn and Alan Ritchson are the scene stealers of the movie. Dunn has a unique way of delivering even the most mundane dialogue and making it funny. His delivery coupled with his acting makes for the funniest moments in the movie. Ritchson, who we are use to seeing play a halfwit in comedies, shows that he can do the smart character just as well. Surprisingly he doesn't deliver any comedic lines in the movie, in a full turn he ends up showing off his dramatic skills and shines bright in the most emotional scene of the movie. The visual effects are another standout of Lazer Team. On both the practical and digital fronts they made every dollar count and it shows. Probably the best effect in the movie is the practical battle-beast Worg that they face in the final battle. Lazer Team is exactly what it was meant to be, an action filled sci-fi comedy that brings out the best in all genres and molds them into one decent movie. If you just want to laugh and be entertained, then this is one of those movies for you.